Your query is just the starting point for Google's searches. Sometimes Google fixes misspellings, replaces some of the keywords with synonyms or other related keywords, disambiguates your query using your search history. These changes usually improve the quality of Google results because it's hard to come up with the perfect query and improving the query is the first thing you need to do to get better results. Unfortunately, Google's adjustments aren't always helpful and this adds noise to the list of the search results. For example, I've noticed that Google matches many pages that mention "iPhone 4" when you search for [iPhone 4S] and that's a really big mistake. Having to use quotes every time you enter a query that includes "iPhone 4S" is annoying, but that's probably an issue that will be fixed when there are more pages that mention the name of Apple's latest phone. Another way to improve Google's query adjustment algorithms is to use "Verbatim", a new feature from the search options sidebar. Just click "show more search tools" in the sidebar, select "Verbatim" and Google will no longer change your query. "With the Verbatim tool, you can search using the exact keywords you typed," explains Google. Verbatim disables Google's spelling corrections and Google no longer replaces some of your keywords with synonyms (e.g. : television / TV), similar terms (e.g: buy flowers / send flowers), words with the same stem (e.g. : fixing / fix). Verbatim also disables search personalization. 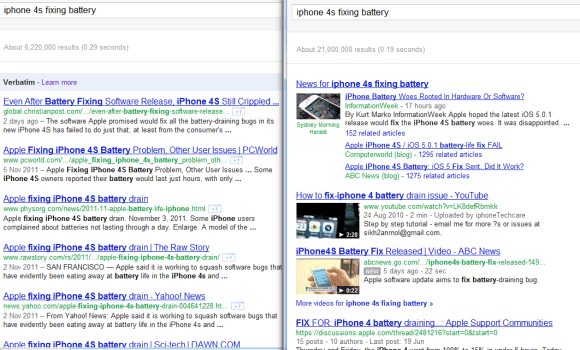 Here are the results for [iPhone 4S fixing battery], after/before enabling Verbatim. "In addition to verbatim search, which will be rolling out to all users over the next few days, we're also applying similar ideas directly to our algorithms, such as tuning the accuracy of when our query broadening search improvements trigger. In the meantime, if you want to search for a very specific term, be that [carosel] or the [etymology of sissors], give the verbatim tool a try," mentions Google. Isn't it the same function as the use of "" to get the exact spelling of what we put between the "" ?? This days Google auto-corrects results in "" too. A weird bug: when I search for, say, [agreement template], and then use Verbatim, I get truncated searches. In google.com, I get a search for [agreement t] (https://www.google.com/search?q=agreement+t&hl=en&tbo=1&biw=1680&bih=987&output=search&source=lnt&tbs=li:1&sa=X&ei=8rDDTpOfJOSj4gSihYy8DQ&ved=0CBUQpwUoCw). In google.pt, I get the results for [agreemen] (http://www.google.pt/search?q=agreemen&hl=en&tbo=1&nord=1&biw=1680&bih=987&site=webhp&prmd=imvns&source=lnt&tbs=li:1&sa=X&ei=KLDDTqafI8jItAbOwLmEDA&sqi=2&ved=0CBQQpwUoBg). So what is the difference between the two results. Is there a way to always use Verbatim, without having to search and select the feature everytime? Oh great i hate this "Google search what Google thinks is what you want and not what you really want" thing. And the example in the post it's just the big problem with this annoying situation. Google verbatim? Did you mean Duck Duck Go? I used to love Google but it's gotten progressively worse. Ditching the + symbol in favor of "" was a pita (too many keystrokes, people) and just about the last straw. If I could have found Google Verbatim and made those settings the default I probably wouldn't have ditched Google as my default search engine. Best of luck in your other endeavors. It is almost impossible to pull up anything that you are searching for exactly. Dont get me wrong you can. In opinion Google is so protective of Google that the end user sufers. For example if I type in the serch term -: GOOGLE FLORIDA COMPLAINTS... I get a whole bunch of confusion and not an exact match. Then if I type using verbaitum the same I get Foreclosure Complaints comming up Number 1 and the and something closr to an Exact Match in the middle of the page. Then if I use QUOTES I get three listings asking me if I wanted to review more with the dupli content ommited. Google no longer honors Exact Match Domains nor it appeqars honors exact match anything. How do I know, well unless I am wrong Google is not in the foreclosure business so when searching for GOogle Complaints Florida it pulled up Foreclosures and I never used the word in the search. Google is trying to be so helpful they are in opinion going to loose the Market in the long run over time. If I am looking for BLUE SWADE SHOES well the only people that are lisitn g LUE SWADE SHOES is the Pay PEr CLicks, all else is something else about BLUE SWADE SHOES,music, mp3, elvis but not just BLUE SWADE SHOES. So GOogle has now made it so complicated GOOD LUCK in finding what your Searching For, and thgat is what I thought a Search Eninge was to do. Well I think Google is the New Yellow Pages and WHite Pages and wants to get everyone listed so it can all be Google World. All I can say is I tried out the verbatim tool and I tried a comparison with the quotes for the same search term. Quotes worked more specific for me. Verbatim appears to put a lot more of what google feels is marketed space for business and huge back linked traffic sites up front. The let's say smaller companies who have built there name online with SPECIFIC company names in their domain names did that for a reason so they could at least compete with larger brands who sold everything. Now Google is going to pandasize that model of online business. It used to be if I sold california golden delicious apples I could tell you to go to californiagoldendeliciousapples dot com and I would OBVIOUSLY be one of the best relevant choices on google. Now if you were to put in california golden delicious apples into google, you get tasty red apple recipes and wlamart books on how to grow your own california golden delicious apples while the guy who really sells them at that specific website is not a choice until way after you get to page 9 or 10 of google past all the wlamart and aamzon and faecbooked links. Feel free to you my words on that... verbatim. It would be better if sites that are selling items for the specific keyword used would come up first. How to make Verbatim the default !!??? Even with Verbatim, a search for "font-size" returns results for "font size"